Elsie Briggs House was built around 1445. This was a time of great expansion and building in Westbury parish, when Bishop Carpenter was in charge. His personal cross emblem is still found on the ancient front door of the House. Westbury College nearby, (part of which is owned by the National Trust), also dates from this time. It is uncertain exactly what the House was used for when it was first built. Historians regard the House as being an important and unusually complete survival from the late medieval period. Several arched stone windows survive, together with larger arched doorways to front and rear of the House, and the massive oak front door. Originally built as a ‘hall House’, with one single room and no chimneys or intervening floors, it has been much altered over the centuries. A staircase and the huge granite fireplace in the Quiet Room were added in about 1600. Most interesting is the roof – of typical Gloucestershire design – whose central arch-braced collar truss and double row of curved windbrace timbers run the whole length of the building. Many other features remain, including evidence of old partitions , bacon racks, hooks and other details. After the Reformation, the House passed into private hands, and over the years was divided into 1, 2 or 3 separate dwellings. 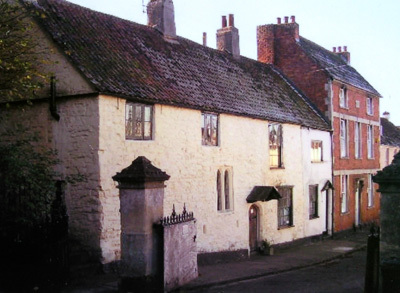 By the end of the 19th century it was being used as a laundry (one of many in Westbury-on-Trym). The base of the laundry copper remains in an outHouse. It is therefore an important party of the history of Westbury, and of great architectural interest locally. As such it is always open as part of Bristol Doors Open Day on the second Saturday in September every year. (See www. bristoldoorsopenday.org). 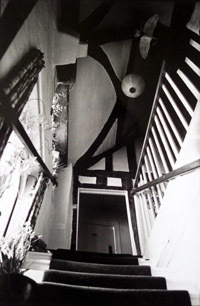 Dr. Elsie Briggs of Bristol University, a much loved local figure, lived in the House from 1958 and did much to uncover many of its 15th century features. On her death in 1988, she bequeathed it to the Diocese of Bristol, and it opened, as she intended, in 1991 as an ecumenical House for contemplative prayer, Dr. Hebe Welbourn being its first warden. When the Friends of Elsie Briggs House bought the adjoining cottage, no 39 Church Road in 1998, this brought welcome additional accommodation, and enabled the 2 gardens to be combined, greatly adding to the beauty of the whole.